The shoreline is a border between the earth and the sea that acts as a physical projection of the unstable balance between bothexpanses. From the jagged rocks to the subtle curves of the beaches, the shoreline is the confluence between specific features of both the land and the sea that agree on their respective territories in an endless war of attrition. First, mankind established itself along the coastline with respect to its natural characteristics. Creeks were used as ports because of their protection against the winds and ocean currents. Then, humanity's necessities evolved, and the shoreline modified to meet these new needs. The coastline has been moved back like the polders, in order to extend habitation and cultivation areas. The shoreline has also been smoothed, for instance in the case of commercial ports, to enable boats to dock. Similarly, overcrowding in cities, such as Tokyo or Singapore, has led to the construction of artificial islands to house their inhabitants. All these changes, emergent from utilitarian and economic external, altered the shape of the shorelines far from their intrinsic attributes. Dubai houses the most radical examples of shoreline operations. The islands of Palm Jumeirah and Palm Jebel Ali are two significant examples of these operations. The coastline of the Persian Gulf is designed as a palm tree in bird’s eye view, the symbol of hospitality and rest in the Islamic culture. The Emirates, once totally dependent on oil revenue, has now diversified its economy. Planted in Dubai, the symbolic palms that have grown with the generation of oil income attempt to spread this symbolism to an urban scale by welcoming tourists and investors under the shades of their leaves. Like the Nazca Lines which were presumably used for rituals to attain water, the palm islands are used by the Dubai government to attract foreign capital to ‘make its rain’. However, from a human perspective, inhabitants of the palm islands do not perceive its symbolic shape. 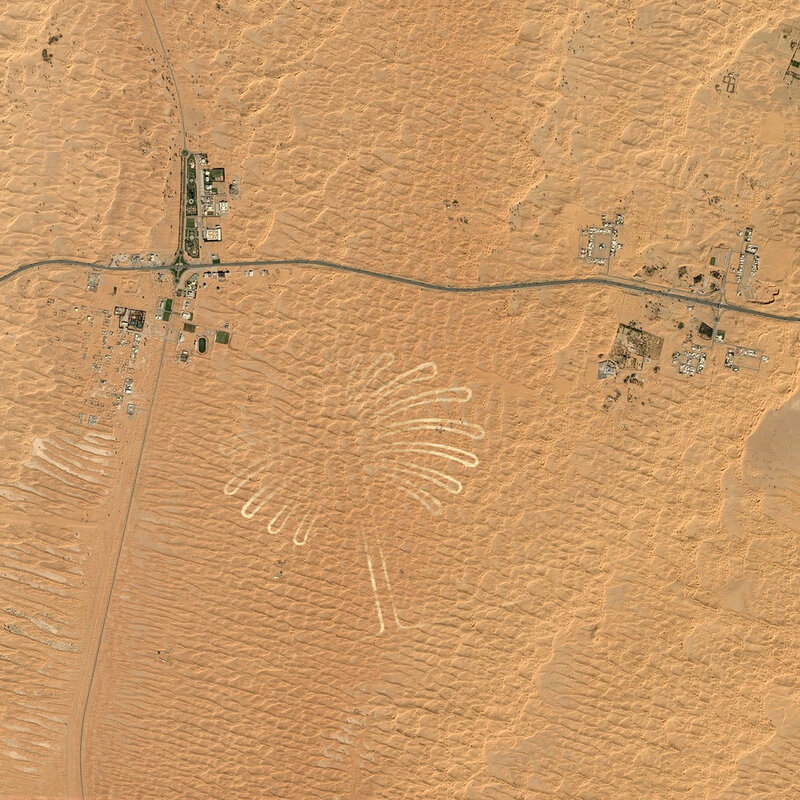 Rather, satellite technology has enabled the projection of these palm shaped borders onto our screens, the only medium where these shorelines become apparent. In a country where camels are retrained as touristic attractions, the past remains a strong nationalist tool. The symbols remain but the use of technology seems almost like a visceral reaction against nature, once so close to the way of life of the Emirati.